In our last blog post, we discussed how the dopamine neurotransmitter works in a brain region called the nucleus accumbens and how its release encodes a rewarding event (think chocolate). More than that, we showed in a diagram how the dopamine release shifts with learning to occur to a stimulus that predicts the reward event. Even more remarkably, we also showed that under these circumstances the dopamine release eventually stops to the reward itself. To us, the dopamine neurons seem to have a certain intelligence, from tracking to predicting what is important, and they do it automatically without our conscious awareness. In this post, we shift gears toward another fascinating brain computation that also involves dopamine. In this case, we are looking at the control of movement, and our anatomic focus is on a large brain area called the striatum. It is so named because from a certain perspective in dissection, it has a striped appearance. This time, we are discussing dopamine brain circuits. The striatum circuit is a basic loop where the most complex and recently evolved cerebral cortex sends a signal to the striatum, which then connects to the substantia nigra pars reticulata (SNr), and then to the thalamus. Output from the thalamus back to the cerebral cortex completes this “cortico-striato-thalamic” loop (Swerdlow & Koob, 1990). This loop is thought to be the place where movements are initiated and it cannot work if the dopamine neurotransmission is not supplied from the substantia nigra pars compact (SNc) to the striatum. Without the dopamine, even though the circuit is intact, it does not function appropriately and movement is impaired. One example you may be familiar with is an individual with Parkinson’s disease. Not only do these patients have uncontrollable muscle movement, as easily seen with their tremoring hands at rest, but also they have difficulty initiating a movement, as we see with the multiple attempts it takes to stand from a seated position. This latter symptom is the most important one and it is all because of the loss of SNc dopamine neurons that project to the striatum. This movement governing loop is shown in the diagram below, but there is more to the dopamine story. Dopamine neurotransmitter release is detected by receptors and they can be divided in to two groups: the D1 and D2 types. They are named for the two different types of receptor to which dopamine can bind after it is released in a signaling cascade. When dopamine binds to the D1 receptor, the next neuron in the brain circuit is activated, whereas when dopamine binds to the D2 receptor, the next neuron is inhibited. But, notice on the diagram above, the locations of the D1 and D2 receptors also mark two different dopamine pathways out of the striatum that both feed forward into the SNr and on through this movement governing loop. The direct pathway (beginning with activation of D1 receptors in the striatum) seems to cause behavior to occur and is referred to as the “Go pathway.” The indirect pathway (beginning with activation D2 receptors in the striatum) seems to cause behavior to stop and is referred to as the “NoGo pathway” (Kravitz et al, 2010). As shown in the diagram above, the direct (Go) and indirect (NoGo) pathways take different routes to the SNr (substantia nigra reticulata), which feeds forward to the thalamus. A positive signal in the thalamus results in the execution of movement. You can begin to understand this circuitry in the diagram above if you know that GABA (in blue above) is inhibitory while glutamate (in yellow above) is excitatory. In the direct pathway, the D1 receptor binds dopamine, which causes activation of these GABA (inhibitory) neurons that feed into the SNr. This negative signal, when acting on another population of GABA neurons that send an inhibitory signal to the thalamus, causes an inhibition of this inhibition – or as we like to say in the neuroscience world, a disinhibition of the pathway. This ultimately positive activity in the thalamus is what results in movement. It might be helpful to think of disinhibition this way: remember when your mother told you not to us a double negative in your speech (I ain’t got no money) because it means the opposite (I do have money)? This is how this direct pathway works. Complicated, right? Well if we have sparked your interest in dissecting this circuitry and you would like to take the time to walk through the indirect pathway, just remember that when dopamine binds to the D2 receptor in the striatum, those cells are inhibited. If you are able to do this correctly, you will see that the signal coming into the SNr is positive, which would cause the opposite effect of the direct pathway on movement again because the messenger between the SNr and thalamus is GABA (in which activation of these neurons would cause a negative signal to enter the thalamus, resulting with a “NoGo” response). The striatum has the responsibility of integrating cognitive, emotional, and motivational information (Mogenson et al, 1980; Haber, 2003) prior to forwarding information to the direct or indirect movement pathways. This secret brain computation adds an additional level of complexity to a single movement and adding the question of “why” a subject may move or not. The answer to that may lie in a brain region that some believe to be the ventral (bottom) part of the striatum, the nucleus accumbens. Remember that we referred to the accumbens and reward in the opening of this blog. Experimentally, researchers have shown that activation of the direct pathway neurons in the accumbens is necessary for reward-learning. When accumbens D1 receptors are inhibited, animals fail to show a preference for chocolate when given a choice between this sweet, rewarding stimulus and standard food. Meanwhile, inhibition of accumbens D2 neurons resulted in the decreased likelihood of an animal avoiding a cage area associated with a foot-shock, suggesting a crucial role for the indirect pathway activity in aversion-learning behavior (Hikida et al, 2012). One of us co-authored a book on this subject (Stellar and Stellar 1985). 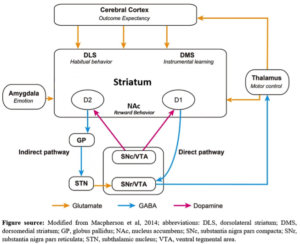 Finally, as indicated in the figure above, a final computation of the striatum involves learning (dorsomedial striatum) and habit (dorsolateral striatum). We plan to write another blog post addressing this issue, but the basic idea is that you learn new behaviors with the former region and store them for later use in the latter region. This information feeds forward in to the brain’s ultimate decision of “Go” or “NoGo” (or whether or not the signal from the D1 or D2 pathway will prevail in striatum output). By now we hope you can see that behavior is not a “yes” or “no” decision and that prior experience and learning immensely weighs into our decisions. With that being said, think of the importance of a student doing an internship in a field in which they are majoring to get the feel of the profession for which they are interested. Think of the student studying abroad trip that gets a student motivated to think that they would like to return abroad after graduation to teach for a year. These educational experiences have the power to modify not only the conscious brain but also the unconscious brain and influence future decision-making. Without these experiences, these complex brain computations could of course be simpler, but by no means do we believe that simpler relates to future success. Haber, S.N. (2003) The primate basal ganglia: parallel and integrative networks. J Chem Neuroanat. 26: 317-330. Hikida, T., Yawata, S., Yamaguchi, T., Danjo, T., Sasaoka, T., Wang, Y., Nakanishi, S. (2012) Pathway-specific modulation of nucleus accumbens in reward and aversive behavior via selective transmitter receptors. PNAS. 110: 342-347. Kravitz, A.V., Freeze, B.S., Parker, P.R.L., Kay, K., Thwin, M.T., Deisseroth, K., Kreitzer, A.C. (2010) Regulation of parkinsonian motor behaviours by optogenetic control of basal ganglia circuitry. Nature. 446: 622-626. Macpherson, T., Morita, M., Hikida, T. Striatal direct and indirect pathways control decision-making behavior. Front Psychol. 5: 1-7. Mogenson, G.J., Jones, D.L., Yum, C.Y. (1980) From motivation to action: functional interface between the limbic system and the motor system. Prog Neurobiol. 14: 69-97. Stellar, J.R., Stellar, E. (1985) The neurobiology of motivation and reward. New York, NY: Springer-Verlag New York Inc.
Swerdlow, N.R., Koob, G.F. (1990) Toward a unified hypothesis of cortico-striato-pallido-thalamus function? Behav Brain Sci. 13: 172-177.